The One Room Challenge™ HERE consists of twenty design bloggers taking on the challenge of transforming a space. Every Wednesday, the designers document their process and share their sources and advice over six weekly posts. Definitely check them out, they are so talented and have done an extraordinary job, and they offer great design advice too! I have joined the ORC as a guest participant this season redesigning a room in our home. You can catch up on all our progress and project details from the prior weeks below. This is the third “One Room Challenge” Happy Haute Home has participated in, seems that each one gets more challenging. Each season, I take on bigger and tougher spaces in our home, but I welcome the opportunity to change up a space and be accountable over 6 weeks. Last year, I participated in the “One Room Challenge” as a guest participant, and showcased our French Country Kitchen Renovation, it was a massive effort of painting 60 cabinets including 2 islands, installing new hardware and new glass for the cabinets, new lighting, renovating a fireplace and furnishing the kitchen. You can catch up on the details and the final reveal HERE. How Did We Decide on Our Bar Space to Remodel? Deciding to update our basement bar space was an easy choice, as we are slowly updating all the rooms in our french country home. But prioritizing the spaces we transform is more difficult. Typically, we prioritize based on “need”. For instance, one of the first rooms we remodeled when we moved to our home was the gym HERE because fitness is important to us. But I must say…sometimes we prioritize based on “want”…as in the case of our upcoming Fall ORC guest participation when we will build a wine cellar. This is the bar area before we started our remodel…ick! Brown cabinets, yellow walls and red pendants. Notice the red wall sconces? And a brown stained fireplace surround. We started the remodel by painting the cabinets and the island with Benjamin Moore Advance Primer HERE and Paint HERE. Some of you may recognize the bar stools, they are similar to the ones we had in our kitchen before the remodel. The stools are black and saddle shaped with silver nail heads and purchased from Arhaus (HERE). We placed three stools on each side of the bar. I chose backless stools to keep the space open and make the countertop more accessible. We replaced the textured glass in the cabinet doors with clear glass panes for a seamless and sleek look. In addition, we replaced the wood shelves inside the cabinets with glass shelves. Adding glass shelves allows the cabinet lighting to shine all the way down and highlight decorative glasses and bottles. I picked up this silver bowl from a flea market..it’s actually a punch bowl. Added white and pink roses for a beautiful centerpiece. The cabinet and island paint color we used is Obsidian by Restoration Hardware. The pendants over the island, are from Restoration Hardware HERE. They are the 13″ pendants in polished nickel. The walls are painted with Benjamin Moore paint using Restoration Hardware color Graphite. The crown molding is painted with Benjamin Moore paint using Restoration Hardware color Sand Dollar. The Fisher and Paykel dishwasher is the only appliance that didn’t need replacing. So far, it has held up very well. The previous ice maker in the home was rusted, noisy, and disgusting. We replaced it with a sleek new ice maker HERE that produces 80 pounds of ice a day. Of course we don’t go through that much ice but when we do need it, ice will always be on hand. We also purchased a new beverage refrigerator HERE, the old one gave out during the remodel. We like Uline appliances for our bars, we never have issues with their beverage refrigerators. They will last a good 13 plus years. In every home project we have worked on involving cabinets, we always add in-cabinet, under-cabinet, and even over-cabinet lighting. This project in no different. We added in-cabinet lighting HERE and under-cabinet lighting HERE for that extra glow, effect, and ambiance. Also added lighting to the top of the cabinets to get that glow on the ceiling. Also, notice the way the interior cabinet lights shine through the glass shelves and light the entire cabinet not just the top shelf? No bar is complete without an LED display shelf HERE. Ours is 2 tiered but they can be purchased as a single shelf or 3 tiered. They are also available in varying lengths. The programmable remote allows the colors to change or remain constant. We love our display shelf and the way clear bottles light up. The black sink faucet SIMILAR HERE is european styled and really lovely. A home bar is a perfect place to enjoy a charcuterie platter with a bottle of wine. Can’t ever have enough champagne on hand. We replaced all the knobs with nickel pulls from Restoration Hardware HERE. We used a variety of 4 inch, 6 inch and 8 inch pulls. We also added 2 wall scones, iron torch style, also from Restoration Hardware HERE. That door opens up to the future wine cellar. Now for the “pièce de résistance”! A hard wired..rotating disco ball HERE with lights! That’s right folks, the ball and lights are hard wired to a light switch and rotates when turned on. What more could you ask for!? And NO, we did not add the ball, it was already in the home. It’s so tacky…we have to keep it! And between you and me, it’s grown on me and I kinda like it 😉 Perfect for a dance party! The island is spacious and great for entertaining. The granite is beautiful and is called Emerald Pearl HERE. It has just the right amount of black, gray and beautiful blue tones with a gorgeous sparkle. For gym ideas, check out post HERE. We are very pleased with our “Rogue” equipment, it gets used everyday. We added a 70″ TV HERE to the Fireplace area. My husband seems to really like the VIZIO brand, great quality for a great price. He mounts our TV’s himself and really likes this brand HERE. These mounts have never failed us…and we have mounted A LOT of TV’s! During our recent trip to Kentucky, we toured a couple distilleries HERE and brought back a few bottles (or a case) with us…in particular this Rye Whiskey is in short supply in our area. Angel’s Envy is one of my husband’s favorite bourbons. I agonized about what to hang over the space above the sink. Shelves, mirror, clock, or sconce? I looked through thousands of paintings and pictures and finally decided on this canvas print HERE. It brings color into the space and is reminiscent of the late 1800’s depicting a scene at the Folies-Bergère in Paris. It is considered the last piece of work by French painter Édouard Manet. I wonder what Manet would think of our disco ball? The wall light over the picture is from Restoration Hardware HERE and is finished in polished nickel. We put a tremendous amount of effort into creating a space we would enjoy spending time in with family and friends and I feel we achieved our goal. Now…time to grab a glass of wine and relax. Salut! I hope you enjoyed following along with us as we transitioned our space, I certainly enjoyed sharing it with you. As I mentioned earlier, our next One Room Challenge, coming this Fall will be our Wine Cellar..stay tuned! For more home renovation inspiration, subscribe to Happy Haute Home and follow along on Pintrest HERE, and Twitter HERE and feel free to pin and tweet your favorite pics from Happy Haute Home. Thanks Mel! You are right…let the party begin!! Woop woop!!! Very, very nice. Love the atmosphere you’ve created. Thank you! Atmosphere was a big influence on the project. I appreciate you noticing. This is toe-curlin-good! Wow, this was a huge undertaking! Congratulations on an outstanding finish. Thank you Sammy! I hope so..well worth the effort, we are very happy with the space. This basement is HUGE! Love it!!! Thanks! It’s a great space to entertain for sure! Well done. I love what you’ve done with the place. The disco ball was a nice touch! Isn’t that a fun piece? I like it too. Thank you for visiting! Very impressive Denise! 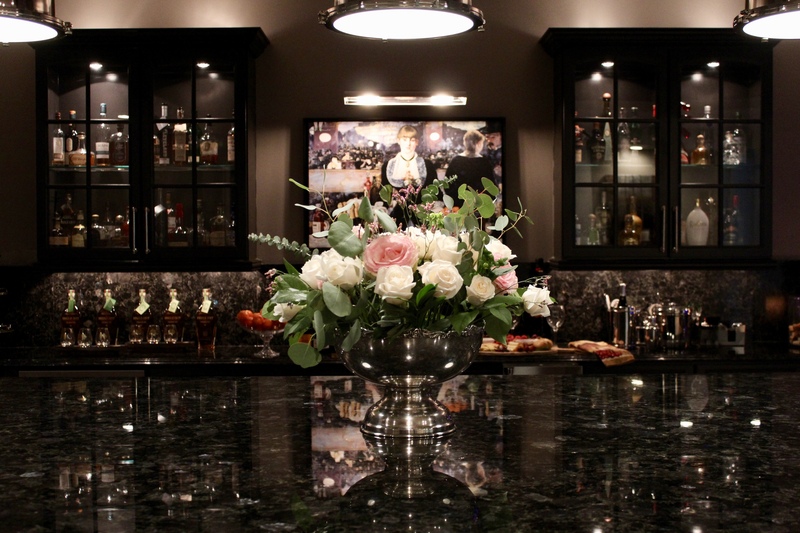 Not only does the bar space look great, but it demonstrates that you have the ability to make different rooms look good in very different ways. Thank you Joe! So nice of you to say! I really enjoy doing projects like these..especially when the before and after are so different! Thanks for visiting! What a beautiful transformation! The black is so much better than the before! I want to come and hang out there so badly! What a gorgeous space! So cool! It looks like a really upscale restaurant bar where fancy people would hang out. I love the details! Thank You Em! How nice of you to visit. It’s a great space and we are lucky to have it. I love the black cabinetry with dark counters. Your bar area is so special! Thank you Joan! How very sweet of you 🙂 We hope to make good use of the space!